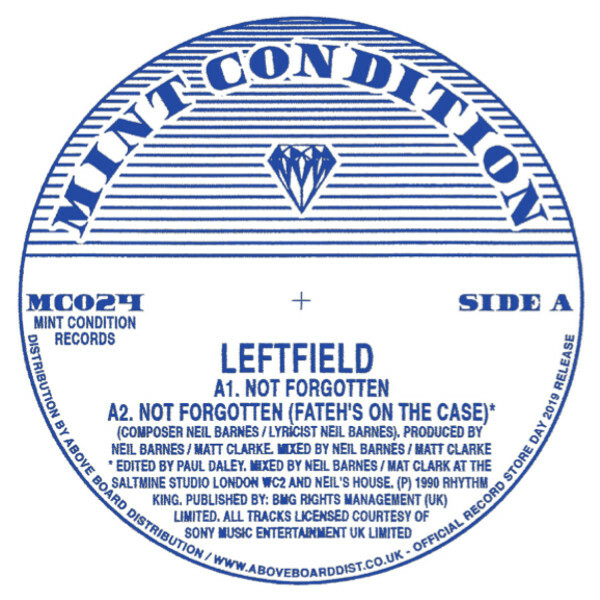 Mint Condition - A reissue label focused on excavating the outer fringes of classic House and Techno. Unreleased mixes, classics and overlooked gems mined from the last 20+ of contemporary dance music are the order of the day. From Chicago, Detroit and New York to London and beyond, Mint Condition have got their expert digging hats on to bring you exclusive heat and those rarer than rare jams that have been on your wants list for years! 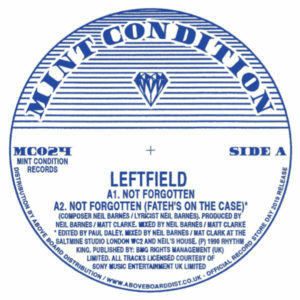 Dig in.... For this outing for Record Store Day 2019 we present the original mixes of Leftfields seminal debut release “Not Forgotten”. This was the London duo's first outing and pre-dates their earth shattering and classic long player 'Leftism' by 5 years with an even more rave / club, underground orientated style. Raw, bass heavy, funky and driving, 'Not Forgotten' was a clubber and pirates anthem for many years to come. Classic UK House music? Most certainly. One of the most influential records of the genre from these shores. Beautifully remastered by the UK's very own Curve Pusher and taken from Leftfield's original DAT. It will never sound better than this! This is the first time this 1990 UK rave classic from this crew has been repressed in 15 years. File under: 'Classic' / 'Essential'.